Buy Canadian Maple Year of the Snake Silver Coins | ?? 1盎司2013蛇年加拿大枫叶密印银币 The obverse depicts the effigy of Queen Elizabeth II (year of issue and 5-dollar face value are also shown). 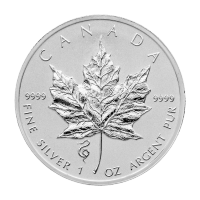 As with all Canadian Silver Maple leaf coins, the 2013 Year of the Snake design includes the series' hallmark assurance: "Fine Silver 1 oz Argent Pur" on the leaf face and the Snake privy mark on the bottom left side of the leaf. These superb releases are perfect for people born in "snake" years - 1941, 1953, 1965, 1977, 1989, 2001 and 2013 - who are regarded as intellectual, superstitious, skeptical, astute, have elegance, innate wisdom, and possibly some levels of supernatural capability.